I wrote a little bit last week about the situation and the dynamic between my mother and my grandmother. 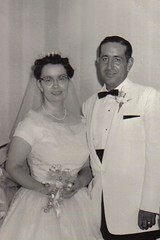 My mother was married on July 26, 1958. Here is the first letter from my grandmother to my mother/ from a mother to her daughter. not at all, but this is for you. After this, I will address you both. Remember how I couldn't talk before and after the wedding too? I don't know what happens, but when you spoke to me rather than breakdown and bawl like a calf, I spoke harshly. I didn't mean a word of it, and as soon as it was said, I could have bitten my tongue out. Pete, poor dear, felt it too. He is such a good person, and he seems to love you so much. I could have never said goodbye to you if we had not said that last rosary. Our Lady sure came through at the right time. I just didn't want you to drive away crying. But the flood gates opened up later, when I went to straighten up your room. But I said to myself, this will never do. She has not gone away forever, she will be back to see us from time to time. I just want to tell you what a precious child you were to me. From the day you were born, you seemed to understand and when Calvin (my uncle) came along and was such a sick baby, you seemed to understand that it couldn't be helped. Through the grades, then high school, and then our struggle to get you a college education. Tho your Dad didn't like it, he helped in every way. I used to get so thrilled when you told me abut the Notre Dame boys you dated. Then the incident with Francis Pall, I'm so glad that fizzled out. I didn't worry about him, but I was a little scared about Hussein and then Kurt; they just weren't for you. You were just too good for them. The first time you brought Pete home, something told me that he was the one. Everyone who met him said that goodness just radiated from him. And wasn't it funny, how I wanted you to marry Pete, and then I hated the thought of it. I have tried all my life not to be a clutching mother, but I guess I was almost one. I knew I couldn't have you all my life. I didn't want it that way. I wanted you to have a life of your own, and I knew that Pete was the one you were to live it with. But someone would say how far it was , and then whew, I couldn't see the happiness it would be for you, but how those miles between us would be. You scared the puddin out of me that Monday morning when you gave the ring back. I just couldn't have it that way. I don't know what I would have done if you and Pete would not have gone through with it, because you were meant for each other. God ordained it that way and I knew it. So now I must ask you to forgive me every hurt I have caused you. You were a good daughter, I only wish I could have done more for you, both materially and in our home life. Spiritually, I never worried on that at all, because you were such a good Catholic. God surely has some strange ways in doing things. Just as my Mom says, "You can't tell me that God didn't fix this one up. How else in the world would Maryrose and Pete have met? Well my dear, this is getting to be quite an epistle. But I only want for you the very best there is in the world. I am sure that you will achieve the ultimate in your life with Peter. He is a good man and he will be a good husband and God willing, a good father. When he is worried, help to calm his worries. When he is sick, nurse him back to health. When you get angry with him, as you probably will (we all do) remember it takes two to make a fight, and to try to say a soft word instead of a harsh one. Never let the sun go down on a petty quarrel, for it is much harder to make up a petty squabble, they seem to grow so after the sun goes down and after it comes up in this morning it is so much worse than it was. But you are a wise girl; you know how to handle things. There will be days when you will be tired and some little things Pete says or does will make you angry. Don't say a word until you say a Hail Mary. By that time you will know your love again. Well, I must close this now. It is getting to be quite a letter. Remember always I love you, and I love your husband as a son and I hope you and Pete have many, many years of happiness. I have tried to imagine just where you are on your trip. They predicted rain and thundershowers for most of the country, I prayed that you would not get caught in them. I hope that you make it home without any trouble whatsoever. I asked your Guardian Angels to stay right in the front seat with you and guard you from all harm. Calvin finished the oats today. The party last night was a huge success. They loved the hay ride. We tried to make it an interesting party, and they seemed to enjoy it a lot. We will send you the Badminton Set with some of the other things we send you. I pray god's richest blessings upon you my dear, and upon your Peter. I take a look at the picture you took, gee whiz, I look like I am carrying all the troubles of the world on my shoulders. Gonna change right now and smile, and smile, and smile until everyone will think I've gone nuts. Huh. Golly, but its lonesome around here knowing that you won't be stepping in from one of the other rooms. I hope that time eases the lost feeling. My poor head can't seem to adjust itself. Quite a whirl we had, no wonder it was so hard for it to accept your leaving. Poor thing, it kept hoping I suppoe, that you would stay here with Pete. Poor wonderful Pete, I'll bet he thinks his mother-in-law is half cracked.